When is comes to lunch, I love to have a satisfiing big plate that will keep me going through the day without too much munching. one of my childhood fav grain is Pearl barley. I guess its because of the crunch that I love so much. There is a lot going on in this plate, from Pearl Barley to roasted veggies (zuuchinis, mushrooms, colorful carrots) to sautéed marinated Tempeh and a green salad on top. Being prepared ahead of time with the ingredients in the house is key to success here. In no time you can assemble a nutritious meal that is so delicious, healthy and colorful. Take a meduim pot and add the pearl barley, water and 1 teaspoon salt. Bring to a boil and then lower the heat to a simmer and let it cook until all the water have evaporated. At least 30 minutes or more. Set aside. Take a baking sheet and line with a parchment paper. Take a mixing bowl and add all the vegetables, (carrots, mushrooms, zucchini and onion). Drizzle with olive oil, sprinkle cayenne pepper, salt and pepper. Mix with your hands, to fully coat the vegetables. Bake in the oven for about 20-30 minutes, until the vegetables are tender. Take a ziplock bag and add the tempeh, olive oil, nutritional yeast, shawarma spice blend, salt and pepper. Shake the bag gently to cover the tempeh evenly. Let it marinade for a couple of hours or overnight. Take a nonstick pan, and add the tempeh in one layer. Turn the heat to medium - low and cook on each side for a few minutes, until golden brown. Take a mixing bowl, and add the cooked pearl barley and the roasted vegetables, mix and add more salt or pepper if needed. 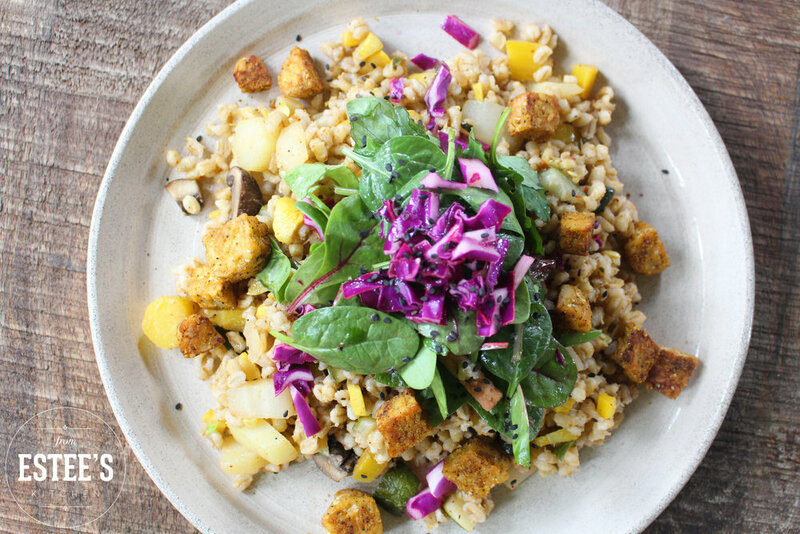 Take a serving plate and pour the pearl barley/vegetables mixture, add tempeh, and green salad on top. You can squeeze a splash of lemon and drizzle some more olive oil before serving. Serve warm or in room temperature.